Difference designed. with performance in mind is a philosophy that began when Bolens was founded, in 1850, and has been a way of life ever since. The real force behind the philosophy is you, the ultimate owner of Bolens outdoor power equipment. We actually begin designing different equipment long before a single line is drawn on our blueprints. We begin by asking two key questions: "What should this equipment be able to do?" "What will Bolens owners want it to do?" Answering these questions skillfully and honestly has given Bolens a reputalion for leadership in outdoor power equipment. From product research to drawing board to manufacture to assembly to dealer service - every step is taken deliberately and patiently to provide you with outstanding outdoor power equipment-equipment that is difference designed, with performance in mind. It's one thing to claim leadership and superior performance. It's quite another to back it up with facts. In 1919, Bolens introduced the first power-driven garden tractor. And dedication to the principle of difference designed, with performance in mind, has instilled in all of Bolens employees a desire to manufacture the best possible equipment. From drawing board to finished product, the Bolens people take pride in their work. Their purpose, after all, is to build equipment that performs the way you want it to. In 1947, we introduced the first compact tractor. It's the engineers's job at the drawing board to see that optimum design is achieved. It's the skilled machinist's job in the factory to precisely tool each part for maximum strength, durability and usefulness. On the assembly line, individual components are fitted to create products which have a big reputation to maintain. During each manufacturing step, rigid quality and inspection standards are maintained. As another measure of the Bolens difference, your Bolens dealers have skilled mechanics who have bees trained to service what they sell. Their parts departments are stocked with genuine Bolens parts to keep your equipment in peak operating condition. In 1963. Bolens introduced Center Pivot Steering on its Lawn Keeper and Estate Keeper. 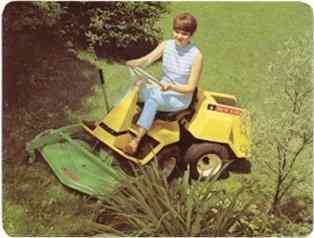 This was a new concept in lawn care and is still a Bolens exclusive.